Will ElBaradei Run for President of Egypt? Egyptian activists, most of them young, were out in force in the midday sun on Friday, Feb. 19, their flags and posters raised high, their chants rippling across the pavement at the arrival terminal of Cairo International Airport. They had come out in a startling show of support for a candidate who has yet to declare his candidacy for the presidency of Egypt. Indeed, Mohamed ElBaradei, who until recently held the top position at the International Atomic Energy Agency (IAEA), hasn't yet decided to run in Egypt's upcoming presidential election. But a campaign on his behalf has started anyway. And on Friday, hundreds of Egyptians  rallied by Facebook and opposition newspapers  filled the street in front of the airport's arrival hall, awaiting the Egyptian diplomat's first return to his home country since his retirement from the IAEA last year, and chanted, "We will not accept inheritance. Raise your voice  ElBaradei will be President." Egypt has what appear to be democratic processes, but it's hardly a democracy. President Hosni Mubarak has held on to power for 28 years and has been subject to only one multicandidate election, held in 2005, which international monitors say was marred by fraud. Mubarak, 81, has not yet said whether he will run in the next election, slated for 2011. But it is widely believed that he is grooming his son Gamal to take the reins if he doesn't. The prospect of a monarchical transition of power riles many in the country of 80 million, where the President is unpopular but opposition groups are routinely stifled. But if ElBaradei runs, this may be the first election in which the opposition groups can present a viable alternative candidate. ElBaradei has broad appeal as a well-established and respected public figure whose career flourished far from the bounds of corrupt regime politics. "We are not just liberal people coming here," said Baha' Ahmed, a pharmacist standing in the crowd with his elderly mother. "People from all over are coming. Not only liberals, but people from all over Egypt, as ElBaradei is very independent politically." Indeed, the roars of the crowd oscillated throughout the afternoon between chants for ElBaradei and condemnations of Mubarak. Some admitted that their support for the returning diplomat was rooted entirely in their opposition to the current President. "We love Egypt, but we hate the government. Believe me, all Egyptians hate Hosni Mubarak," said Ayman Helman, a clothing-store manager who was draped in an Egyptian flag. Behind him, a crowd chanted, "Egypt has 1,000 alternatives. And ElBaradei is the evidence ... Hey ElBaradei, there's no going back." In a country where political demonstrations require official permission and signs of popular unrest are regularly greeted with swarms of riot police, the ElBaradei reception was remarkable. Crowds gathered, chanted, called for an end to Mubarak and even entered the airport. And there were no riot shields in sight. "Mohamed ElBaradei is an international figure," says Samer Shehata, an assistant professor of Arab politics at Georgetown University. "Although I wouldn't put it past the regime, it would be a media blunder to greet him with scores of riot police trying to block supporters from showing their appreciation and welcoming him back to Egypt." ElBaradei is unusual by Egyptian political standards. He's an outsider to regime politics  a fact that the state-sponsored press has been quick to use against him. But it's a quality that also works in his favor. 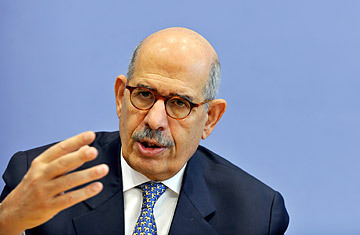 ElBaradei served in Vienna as chief of the international nuclear watchdog for 12 years, during which time he gained international recognition for challenging the Bush Administration's claims that Iraq had nuclear weapons ahead of the U.S.'s 2003 invasion. In 2005, ElBaradei was awarded the Nobel Peace Prize for his work to curb nuclear proliferation. Politically, his supporters say, he has a clean record. Even so, ElBaradei's potential political campaign will face an intimidating stack of obstacles. The next election is unlikely to be any less controversial than the last; the regime has already launched a crackdown on Egypt's largest opposition group, the Muslim Brotherhood, and two ElBaradei supporters were arrested and then released earlier in the week for spray-painting anti-Mubarak graffiti. The Egyptian constitution, as it stands, makes it nearly impossible for ElBaradei to run. Article 76 requires that a candidate be the head of an officially sanctioned political party for at least a year before entering the race. And ElBaradei himself has said that he would run only if the election promised to be free and fair and would be supervised by the judiciary and the international community. "I don't think the real problem for ElBaradei or for us is to get him to power. I think the real challenge for us is to achieve real democracy in Egypt," says Alaa al-Aswany, a best-selling novelist and the most famous public figure behind the ElBaradei campaign. "The constitution we have now is specially made just to keep President Mubarak in power. What we need is a real constitution, real democracy, and then after that, anyone who is chosen by Egyptian voters for President is going to be most welcomed." An equally daunting problem may be a legacy of poor political participation. The government reported 23% voter turnout in the last presidential race, but analysts say that statistic is likely to be inflated. Many Egyptians are apathetic about participating in elections because they don't believe they can effect change in a corrupt system. Others say they simply have other things to worry about. The U.N. says 23% of the Egyptian population lives below the poverty line. "Who is Mohamed ElBaradei? I don't know him  only that he's a candidate, like Amr Moussa [the Egyptian current head of the Arab League] and Gamal," said 25-year-old Mohamed Abbas as he drove his taxi through downtown Cairo earlier that morning. "Most of them are criminals anyway. The people are more concerned with making a living and finding a way to get married." By nightfall on Friday, the airport crowd had swelled, and the chanting had become louder and more unified. ElBaradei was reportedly unable to make a grand exit because the crowds were too intense. When he finally did emerge, it was in a black SUV, driven through the crowd as press and supporters  now having reached a state of hysteria  flung themselves like paparazzi at his windshield. He didn't stop. See the best photos from 2009.